Our world faces tumultuous times amid the spread of terrorism, some terrorists would tryto get their hands on dirty bombs (radioactive weapons). Prospects seem more appalling since terrorists hold suicidal aims to blast the world into pieces. Implementing stronger security measures calls for sovereign governments to enhance global cooperation to stem the tide of terrorism. At this critical moment, Chinese President Xi Jinping arrived in Washington D.C. to attend the 4th Nuclear Security Summit from March 31 to April 1, where more than 50 national leaders and four international organizations were in attendance. 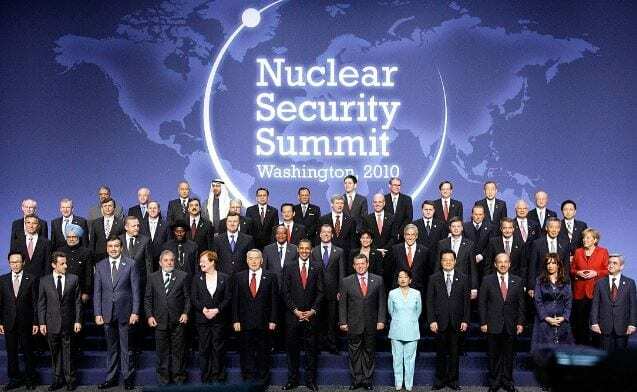 The summit’s agenda focused on the safety of handling nuclear materials, preventing nuclear reactor leaks, as well as addressing nuclear weapons proliferation and terrorism. The possibility of the IS possessing dirty bombs is not a joking matter, posing as a real and ominous threat. A terrorist could steal nuclear materials from scientific research labs at a university or hospital, where such civilian facilities are not guarded by military personnel. Covert agents, working on behalf of IS, could pose as chemists, storage clerks, security guards or medical workers to obtain uranium or plutonium and then transfer the isotopes to a secret location to build a bomb. Constructing an atom bomb is not difficult, considering that anyone could visit a university shop to purchase nuclear-chemistry textbooks. Accordingly, governments have a responsibility to work more closely with universities and hospitals to ensure that the right precautions are taken to prevent criminals from gaining access to radioactive materials. The Chinese government has already engaged in proactive measures to support nuclear safety. Last December, the China Atomic Energy Authority (CAEA) had completed construction of the Center of Excellence on Nuclear Security (COE)in suburban Beijing. As the largest, best equipped and most advanced facility of its kind in the Asia-Pacific region, the COE will serve as a venue for a variety of international exchanges and cooperation programs. The Center plans to train 2,000 nuclear security staff for China and Asia-Pacific nations each year. The center was established in partnership with the United States and was inaugurated in Beijing on March 18, while Washington has agreed to provide nuclear security equipment. The center was completed for construction one year ahead of schedule, which marks a milestone for China’s development in the nuclear industry. China has plenty of reasons to boost its nuclear security. The nation has 30 nuclear power plants in operation and 24 generators are under construction, scheduled for completion by 2020. China’s 13th Five-Year Plan has highlighted Beijing’s pledge to upgrade nuclear and radiation safety by offering more training on prevention and how to cope with accidents. Keeping the world safe from nuclear disasters and terrorism would need international cooperation. A nation cannot stand alone to halt a nuclear catastrophe. Fortunately, Beijing is playing a pivotal role to maintain nuclear security, despite the challenges that confront our world.